FULLY TESTED & EXCELLENTWORKING SUZUKI ORIGINAL THROTTLE BODY COMPATIBLE FOR SUZUKI JIMNY, IGNIS, LIANA & SWIFT 2000-12. ENGINE CODE: M13A 16V DOHC 1.3 LTR PETROL. 100% SUZUKI GENUINE PRODUCT WITH 3 MONTHS WARRANTY. This fits1.6 and 2 ltr petrol grand vitara 1998 to 2005. We are a Suzuki dismantler located in. in good working order. This is a Throttle Body removed from a 2008 Suzuki Swift 1.3 Petrol. This will fit 1.3 Petrol models between 2008 and 2011. LIANA 1.4 DDiS. -VITARA WITH 2.0 HDI PEUGEOT ENGINE. - GRAND VITARA I 2.0 TD WITH PEUGEOT ENGINE 1998-2005. SUZUKI REFERENCE NO: 15980-67G00 / 15980-73J00. Part Numbers: 79J02J07. Engine Size:1.6 16V. 1 x Throttle Body. South Hams Car Spares. We are breaking 100's of different vehicles, with many parts on the shelf. Suzuki Swift MK2 (RS) 1.3 Petrol 2006 Throttle Body (#3509). 09 PRESENT SUZUKI ALTO SZ3 1.0 3CYL 12V 68BHP 5SP THROTTLE BODY REF DC277 #503. Condition is Used. Dispatched with Other 48h Courier. Models > Wagon R. We send details of your order to the Suzuki dealer nearest to you. Take a Suzuki authentic part for example. So hassle free fitting and you have to replace them less. Each component is manufactured using the latest technology, and of course, is designed to enhance your Suzuki’s unmistakable look and style. For sale is a throttle body from a 2006 Suzuki Grand Vitara 1.6 Petrol - may fit other years. Suzuki swift secondhand throttle body. this is the fully electronic body with no throttle cable. We are a Suzuki dismantler located in. fits 1.3 and 1.5 petrol vehicles. Suzuki Jimny 1.3i (1998-2003). Throttle Body. Changed your mind?. Suzuki Swift GTI Throttle Body. Condition is Used. 62J3 8K23 5110. Suzuki Swift Throttle Body 2009 1.3 Petrol M13A. Removed from a Suzuki Swift 1.3, 3 door, 2009. Not suitable for the early mk3 models that use a throttle cable. Suzuki Splash MK1 1.2 4-Cyl 16v Petrol 2009 Throttle Body - 73K083100144 (#3692). Part number:12K02-5110 623J3. Engine Size:1.3 16V. 1x Throttle Body. We are breaking 100's of different vehicles, with many parts on the shelf. 1.5L (1490cc) Petrol 102 Bhp 3Door Hatchback 5 Speed Manual RHD Air Con: Yes. We are Breaking a 2009 Suzuki Swift GLX. Paint Colour: Superior White. Mileage: 86,727. Wing Mirror Type. All parts are used but fully tested and in full working order before removal. 2000 Suzuki Jimny 1.3 Petrol Throttle Body 13420-52G0 G13BB In good condition and full working order. 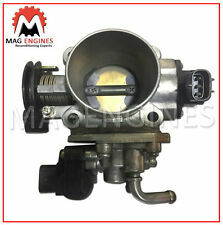 Suzuki Alto MK4 throttle body 1.1 1061 cc F10DN 5 Speed Manual FFB2 01/01/2003 to 31/12/2006 Petrol 16 Valve GL 5dr Mark4 v54-16713. UK: AB31, AB33 -> AB38, AB44 -> AB45, AB51 -> AB56, FK18 -> FK21, G84, HS1 -> HS9, IV1 -> IV36, IV40, IV52 -> IV54, IV63, KA27 KA28, KW1 ->KW14, KW15 -> KW17, PA20 -> PA40, PA41 -> PA49, PA60 ->: PA78, PH19 -> PH41, PH42, PH43 -> PH50, TR21 -> TR25, ZE1 -> ZE3, Isle of Wight, Northern Ireland and all Isles off mainland UK. Part Number: 4Z06 AC38-908. 1 x Throttle body. Engine size:1.1 16v. We are breaking 100's of different vehicles, with many parts on the shelf. Suzuki Liana. 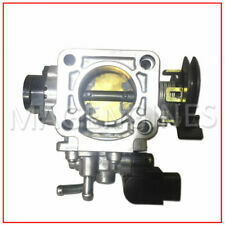 Engine Throttle Body AC50-901 2129. 'Suzuki Liana'. Item is in good clean working condition but does have a few age related marks. Suzuki wagon r 1.3/ jimny secondhand throttle switch. this fit 1.3 wagon r and jimny with the G13bb engine(single overhead cam ). We are a Suzuki dismantler located in. only switch, not body. in good working order. INJECTOR RAIL X 4. SUZUKI SPLASH 1.2 LITRE PETROL 2013 MODEL. AJ SPARES is a large independent Vehicle Dismantlers. South Yorkshire. The Blue Containers. 13400M71M00. 2013 SUZUKI ALTO Throttle Body. Fuel type: Petrol. This item has been removed from a: 2013 SUZUKI ALTO. Model: ALTO. Part Type: Throttle Body. Factor Number: HFTB00265 THROTTLE BODY. Make: SUZUKI. 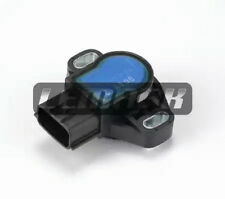 Suzuki grand vitara secondhand throttle switch. this fits1.6 and 2 ltr petrol grand vitara. We are a Suzuki dismantler located in. Kent 10 Min's from J4, M25. PART NUMBER 1811779F11. 03 07 SUZUKI ALTO MK2 1.1 16V PETROL 62BHP 5SPD MANUAL. ALL OF OUR PARTS ARE USED PARTS! ALL ENGINES SOLD ARE SOLD AS BARE ENGINE HEAD amp;amp;amp;amp; BLOCK - ANY ANCILLARIES LEFT ON THE ENGINE ARE NOT TESTED. OUR REF: 1038-2410181331171147. THIS DOES NOT INCLUDE NI, ROI, HIGHLANDS OR OFFSHORE ISLANDS. JOHNSONS VAUXHALL CAR BREAKERS LTD.
Fuel type: Petrol. 2012 SUZUKI SWIFT Throttle Body. This item has been removed from a: 2012 SUZUKI SWIFT. Model: SWIFT. Part Type: Throttle Body. Make: SUZUKI. Door: 5 Door. Body Style: Hatchback. Fuel type: Petrol. 2010 SUZUKI SWIFT Throttle Body. This item has been removed from a: 2010 SUZUKI SWIFT. Model: SWIFT. Part Type: Throttle Body. Make: SUZUKI. Door: 3 Door. Body Style: Hatchback. GENUINE 09/59 SUZUKI SWIFT 1.3 PETROL THROTTLE BODY. Condition is Used. Dispatched with Royal Mail 2nd Class. (SUZUKI SWIFT Throttle Body 0000308370. Other Details: Mk3 1.3 Petrol,Code M13A 04-10. 1.3 Petrol. Jersey, Guernsey, Scilly Isles) as well as for the Scottish Highlands. Part No : ADK87401. SUZUKI GRAND VITARA 1998-05 2.0DT Fd Est 4 x 4 5 MTM RHW TB83 10/03>12/05. SUZUKI GRAND VITARA 1998-05 2.0DT Fd Est 4 x 4 5 MTM RHW TD83 02/01>12/05. SUZUKI GRAND VITARA 1998-05 2.0DT Fd Est - XL-7 4 x 4 5 MTM RHW TX83 10/03>12/05. FULLY TESTED & EXCELLENT WORKING SUZUKI ORIGINAL THROTTLE BODY COMPATIBLE FOR SUZUKI JIMNY, IGNIS, LIANA & SWIFT 2000-12. ENGINE CODE:M13A 16V DOHC 1.3 LTR PETROL. COMPATIBLE FOR VARIOUS MODELS OF SUZUKI FITTED WITH ABOVE ENGINE SPECIFICATIONS. THIS ITEM HAS BEEN REMOVED FROM A 2017 SUZUKI VITARA 1.4 BOOSTER JET. THIS IS A GENUINE SUZUKI USED PART. We will always help you to have a 100% positive happy buying experience. CONDITION: USED. GENUINE OEM PART. Donor Vehicle: SUZUKI GRAND VITARA 1.9 DDIS MANUAL 2005. ANY LOCATION OUTSIDE THE UK. Arran - KA27 KA25. Oban - PH 33, PA20-49, PA60-80, KA28. Inverness - ALL. Shetland ZE1-3. Orkney KW15-17.